Hatters boss Nathan Jones is keeping everything crossed that his side draw one of the Premier League giants in the FA Cup third round draw this evening. Town made their way through with a 1-0 victory at Bury on Sunday, meaning they have reached this stage for the third season running. 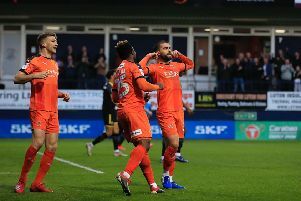 Wary of an extended run in the competition affecting their league form, which has seen Luton climb to third in the League One table, just two points away from the play-offs, Jones said: “I just hope it’s a real goodun. “I want a real good tie now because the further we get in this, yes, the reputations increase and revenue will increase and so on, but it will take the focus away.